A light brown crab salad of fresh flavours this is a delicious way to balance the shellfish flavour. When mackerel is in season and my hubby has been out line fishing he can sometimes come back with up to 40 fish. I love mackerel but the thoughts of gutting 40 odd mackerel and cramming them into our tiny freezer fills me with dread. The perfect way to deal with this glut is to swap the freshly caught fish on the quayside with local fishermen. Often we will get a few crab or a lobster in exchange and that to me is a great trade. The thing is I’ve struggled to cook them perfectly in the past, either by cooking them at too high a temperature and ending up with rubbery meat or by overcooking them and losing some of the flavour. I’m not a fan of having to work too hard to get to my reward either and until now I’ve stuck to the white meat in the crab claws and legs, then use the body for stock. Last Saturday Catherine of Mum of Invention blog invited me to a shellfish masterclass she had organised with Peter Caviston of Caviston’s in Glasthule. My husband was on holidays and so I was eager to book myself in for as many foodie experiences as I possibly could, so I accepted instantly and packed my Northsider’s passport. It was great to finally meet Catherine along with Julie from Shananagan’s blog and to see Adam from CookItYourself again. Peter gave generously of his time, experience and stories. I learnt that in order for the flesh to come away easily from the shell we should steam our crab and lobster. Then how to take the shellfish apart and strip the edible meat from the shells. From there really (to excuse a fishy pun), the world’s your oyster. Brown crabmeat can be strong flavoured and the texture is akin to caviar. The white on the other hand is more delicate. This means that the brown meat can carry stronger flavours. With this in mind, when I got home and took apart the 4 crabs I had snaffled for the bargain price of €2.95 each in the shop next door I heated my wok and played around with aromatic spices until I got the right balance. I like my food spicy but the key here is to commence with the brown meat and then add the herbs and spices that you like. This recipe is a starting point so feel free to play around with how you serve it. Put the wok on a medium heat on your hob. Make sure you have a well seasoned wok before heating by rubbing it with a piece of kitchen towel soaked in ground nut oil. You’ll add more oil before cooking. Cut the cucumber in half. Chop each end off and use the teaspoon to remove the watery seeds from the centre. Chop the scallions into bite sized chunks. Separate the white and green section and place on the plate. Use the teaspoon to scrape the skin off the fresh ginger then chop it finely. If it’s a bit old and woody then grate it finely instead. Put onto the large plate. Chop the garlic and chilli finely. Make sure to wash your hands, knife and chopping surface after the chilli! Put onto the large plate. Put 1 tablespoon of oil into the wok which should be up to temperature by now. Add the garlic, chilli, white scallion and ginger to the wok along with the sesame seeds. Stir quickly for 2 minutes to stop them burning and to release the aromas. Pour in the crabmeat, then mix well with the spices. Remember it is already cooked so you don’t need to cook it, rather heat it through. Put the rice wine and the soy sauce into the wok now and stir again for 30 seconds. 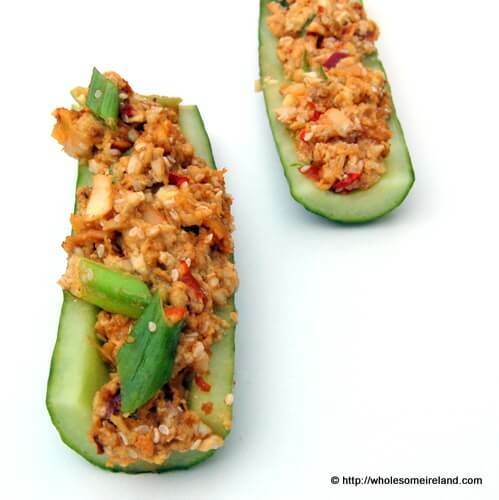 Pour straight from the wok into the hollowed cucumber and serve. If you prefer you can wait until the salad is cool but I found that the hot meat and the cold cucumber was a great combination. In other news, I’m delighted to have been nominated to the Long List of the Best Food/Drink Blog for the Blog Awards Ireland 2012. Thank you to those who nominated to me and fingers crossed I make the short list! I’ve also started a new (to me) Wholesome Bites roundup on a weekly basis. These will be issued every Friday and in case you missed it for this week or are interested it’s a short audio piece which you can play by clicking here. One of the many things I like about your recipes is the way you cover ALL the stages – including washing hands after chilli chopping. I still forget occasionally and can absolutely guarantee that when I do I’ll get something in my eye and touch chilli finger to it. In this house the brown meat in crab is the reward for the person doing the crab picking – we aren’t good at sharing and it often just gets eaten with a teaspoon. This looks very good though. I’ll bear that in mind K no problem! I love mackerel, especially a smoked one, but I can imagine that 40 it’s too much. I far prefer smoked mackerel to fresh caught myself Magda!